Opinion: the Chicago Architecture Biennial stands out from an avalanche of pointless events by doing things its own way, says Sam Jacob. But can it be sustained? This is the age of "inalification". Every city, every form of creative practice – at vast expense and even greater effort – mounts gigantic productions that celebrate... well, what exactly? Prefixed as Bienns and Trienns, these events marshall entire disciplines, command acres of physical space and even more media space. Who is showing what to who and to what end? Somewhere between trade fair and culture; between tourism, city branding and professional interest; between public outreach and academic study, these are events that wield a vast array of (often conflicting) interests under a single umbrella. What, you wonder as you walk in a daze though another installation, is the point of another of these? Your feet hurt, your mind is numb and you can't find the way out. Acres of speculative projects of sometimes patchy quality stretch out before you. What, you wonder as you walk in a daze though another installation, is the point of another of these? And sure, there are moments as you wander through the grand spaces of Chicago's Cultural Centre this malaise mists your view. But that would be missing the point. Sometimes it's not the detail, not exactly the content of these kinds of show. In their very nature they are uncuratable compared to traditional gallery shows. Unless that is you take the executive decision, as Rem Koolhaas did for much of the 2014 Venice Biennale, to author it all yourself. Sometimes it's the umbrella itself that is the remarkable thing. 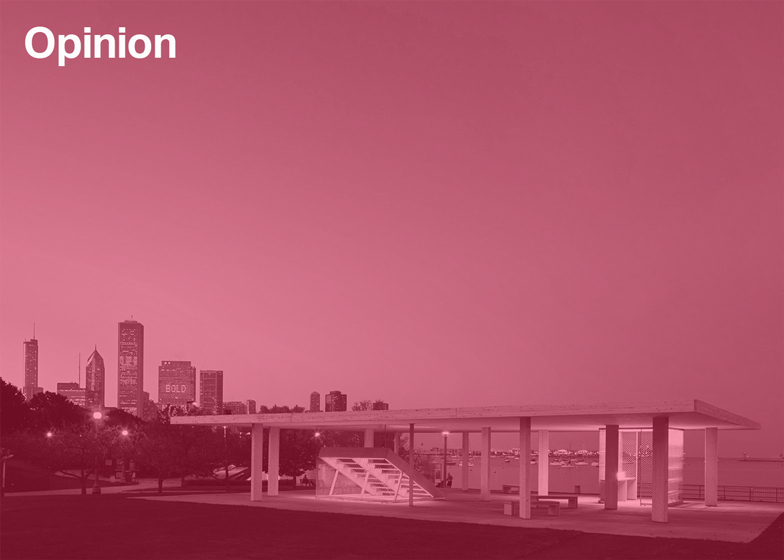 So it is with the Chicago Biennial – a thing that should be understood more as platform than proposition. Or more exactly, a platform as proposition. Which is why, perhaps, it's confused some critics looking for the simple hook. Why it's provoked some architects who find the idea of the discipline as a discursive diaspora an anathema to their more traditional declamatory and adversarial modes. Chicago boldly imagines its own definition of what a biennial might be. And its one that is deeply rooted in the visionary, imaginative tradition (rather than history) of Chicago itself. Chicago might, to a European sensibility at least, seem somewhere in the middle of nowhere. A huge lake to one side and miles of flat farmland to the other. But it's a city of such city-like qualities that makes it a quintessentially urban experience. And so Chicago remains an ideal situation to consider a version of Frank Stella's aphorism, which we might state like this: "There are two problems in architecture. One is to find out what architecture is and the other is to find out how to make architecture." Chicago might have the history, but it's also is a city blessed right now with a vibrant architectural culture. There are the institutions of course, three schools of architecture, the Art Institute, the Graham and more, all of which support and promote contemporary ideas about architecture, design and the city both locally and internationally. "Chicago is a living laboratory of future infrastructure"
But it's also blessed with personalities too. There's Sarah Herda at the Graham (and the instigator and co-curator) of the Biennial, Zoe Ryan at the Art Institute and Bob Somol at UIC, with living Chicagoan architectural legend Stanley Tigerman holding a torch that he often brandishes like a cattle prod. These places and people have helped to give space, opportunity, support and direction to an incredibly vibrant – and young – scene. The city's spectrum of talents might stretch – and this is a sketchy Chicago seven to say the least – from Jeanne Gang's ever expanding office, to Urban Lab, Norman Kelley, Design with Company, Paul Preissner, Ania Jaworska, Grant Gibson and many more who are helping in different ways to shape a new vision of what Chicago means architecturally. It's a scene that draws on Chicago's own history, that history of architectural experiment that includes its accelerated urban-infrastructural origins: Burnham-big-plan and verticality; an architectural heritage that – even forgetting Sullivan and Wright – spans the Modernisms of Mies and Goldberg, the Postmodernism's of Tigerman and Jahn. It's an architectural legacy that means a parking garage in the shape of a cyclopean Rolls Royce is just around the corner from a Mies van der Rohe tower. Look closely at the kind of work emerging from Chicago and you'll see how this unique background is somehow embedded in its thinking. Not as historical pastiche but as a provocative potlatch of possibility. The Biennial is part of this scene. Not an alien event, not just a parachuting in of a vast array of global talent into a tabula rasa, but another expression of Chicago's own contemporary culture. Yet it's a scene that is incredibly fragile. In Chicago, just as it is across the US, prospects for young architects are tough. There is a disconnect in the networks that we enjoy (even as we fail to recognise them) in London – where it is not unusual to find developers, planners, architects and academics bonding over warm white wine at some event or other. In the US, things remain far more siloed. Coupled with the lack of public opportunities, that makes it hard for young firms to break out of the cycle of apartment, restaurant and gallery show. If the Biennial has offered a moment of dialogue, can the discussion continue? What the Biennial has done, thanks to the intelligence and guile of Sarah Herda and Joseph Grima, is to make a persuasive argument for architecture to the city. Just see how involved the mayor was in the opening events and how much support the city has given. The Biennial is a international exhibition of course, but it's also a statement about the possibilities of a productive relationship between architecture and the city. Right here, right now. If the legacy of this Biennial is anything, it's about how more productive relationships might be forged. This is a challenge to politicians and developers: whether the brutal landscape of the contemporary American city might offer opportunities to implement architecture as a force for better cities. But equally, it's a challenge for architects. If the Biennial has offered a moment of dialogue, can the discussion continue? Can architects marry their undoubted and vivid imagination with Chicago's famous pragmatism to continue to forge the cultural and disciplinary content with a public-facing awareness? Can they continue to advocate for the necessity of architecture (rather than just the act of building) in the creation of the contemporary city? As some have noted, this Biennial is notable as a generational shift. As a show, it might have its beastly moments but at least they are different beasts. This is a different generation, instigating, curating, arguing and proposing their own interests and urgencies. Does this make it better? No. But it does make it important. But again, given the platform, what will this generation do with it? This is the Biennial's disciplinary challenge. The Biennial's last challenge though is to itself. Having unfurled its umbrella, established a platform, initiated relationships and dialogues and shone a light into areas and figures within the the discipline not always so used to the spotlight, what will it do next? After all, as Bob Somol titled a panel discussion at IIT on the opening weekend, it's not a biennial till you've had another. Can Chicago's idea of a biennial remain so open, engaged and generous even as it becomes a fixture on the global calendar? Sam Jacob is principal of Sam Jacob Studio, professor of architecture at University of Illinois at Chicago and director of Night School at the Architectural Association, and edits Strange Harvest. "Architecture is finally moving beyond a homogeneous status quo"